Interestingly, one of my modifications is the same as Megan's; you do NOT need to do this in a slow-cooker. 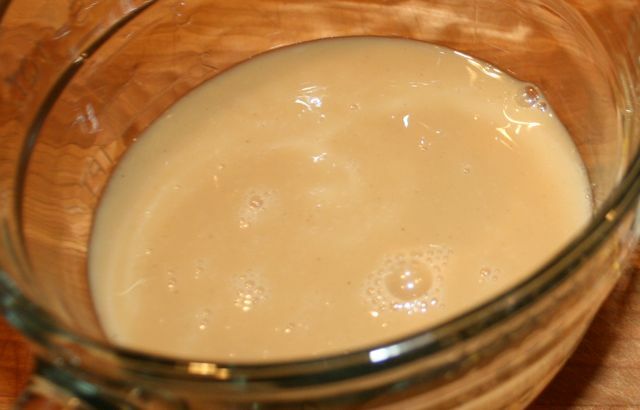 Enjoy any way you would cream gravy OR brown gravy. It's YUMMY stuff!! 1. Put all the ingredients in the blender or food processor, EXCEPT just add 1 1/4 cups of the water. Blend until smooth - this could take several minutes. The longer you blend, the smoother the gravy. Blend, blend, blend. Pour into a pan or medium cast-iron skillet. 2. Put the rest of the water in the blender. Blend again to make sure you got all the cashew mixture. Add this to the pan. 3. Turn on heat to medium, bring to a gentle simmer, whisking often (but not constantly as you need to with other gravies). Cook for about 5 - 7 minutes until thickened. If it gets too thick, add a little water or plant milk. (I usually season with a little salt and a lot of pepper, but that's just me). Cashew gravy? GTFO. This is on my Txgiving menu now, thanks! ps- a move to PDX might be in the future. How far away are you from there? You are the gravy queen! I love how I can find any gravy type sauce on your blog. Another wonderful gravy recipe! Your blog is becoming my go-to primer for making sauces. Yum! Looks like another great gravy recipe. I think that this gravy idea for MoFo is so great! It must be challenging though! This recipe sounds lovely, I will have to give this a go some time.